The DeKalb County Community Foundation's commitment and support to land use and watershed planning is made possible by 20 CommunityWorks funds, generating over $100,000 annually. Learn more about CommunityWorks. The CommunityWorks Land Use initiative goal is to provide reliable tools and resources that DeKalb County decision makers use to inform land use decisions that maintain, manage and protect water resources through a watershed approach. The DeKalb County Stormwater Management Planning Committee continues to work together with DeKalb County Community Foundation to identify opportunities to address flooding and stormwater management issues throughout DeKalb County. 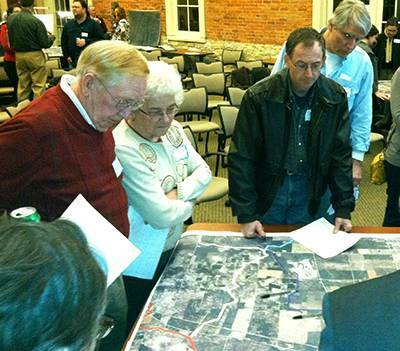 In 2012, the Community Foundation partnered with DeKalb County government in securing $58,615 from the Illinois Environmental Protection Act to conduct watershed planning in a portion of DeKalb and Kane County. CommunityWorks funds provided a $30,000 cash match along with local in-kind resources to fund this $115,000 stakeholder-driven project. The 18-month project, coordinated by a 10-member Watershed Steering Committee representing the watershed area, is designed to address flooding and stormwater management issues in three sub-watersheds in western Kane County and east-central DeKalb County. This area includes the communities of Cortland, Maple Park and portions of Sycamore. The Community Foundation's primary role is to coordinate outreach opportunities within the community. As a result of the project, decision makers, including residents and county and municipal officials, have a prioritized list of projects to address or alleviate specific problems identified within the watershed. The DeKalb County Community Foundation Land Use Steering Committee continues to work with the DeKalb County Watershed Steering Committee and Stormwater Management Committee to consider future watershed planning and implementation projects throughout DeKalb County. For more information on watersheds in DeKalb County including plans, best practices, regulations and projects, visit the DeKalb County Watersheds website. June 2017 - The third DeKalb County Watershed Bus Tour took place on Saturday, June 17, 2017. Funded by the DeKalb County Community Foundation, the watershed tour was made possible through the joining efforts of the DeKalb County Soil and Water Conservation District, Northern Illinois University Depart of Geography, and the DeKalb County Watershed Steering Committee. Tour stops included the headwaters of the South Branch of the Kishwaukee River, wetland, prairie, conservation and farmland best management practices, the Kishwaukee River Water Reclamation District wastewater treatment facility in DeKalb, the CHS Elburn plant in Sycamore, and examples of urban stormwater management projects. Guiding the tour was Mike Konen, NIU Department of Geography and Dean Johnson DeKalb County Watershed Coordinator, and Resource Conservationist with the DeKalb County Soil and Water Conservation District. August 2016 - The Sycamore Park District watershed improvement project has been completed. Three new interpretative signs have been installed (tees 10, 13, 15) explaining the importance of watershed management and the positive effects. Several areas along the East Branch of the South Branch of the Kishwaukee River have been redeveloped to restore native plant species to the banks which will improve water quality and control erosion. After years of discussion, data collecting, and mapping, it's exciting to see the first watershed improvement project completed. October 2015 - We are happy to announce the beginning stages of the Sycamore Park District watershed improvement project. This project focuses on two river/riparian areas along the East Branch of the South Branch of the Kishwaukee River that runs through the Sycamore Golf Course. Immediate results will be improved water quality, erosion control, and restored native species. Education is another piece of this project including interpretative signs and other outreach in areas along the watershed. CommunityWorks Land Use Grants are initiated by invitation only. For questions or more information, please contact Community Engagement Director Teri Spartz at 815-748-5383 or t.spartz@dekalbccf.org for assistance.